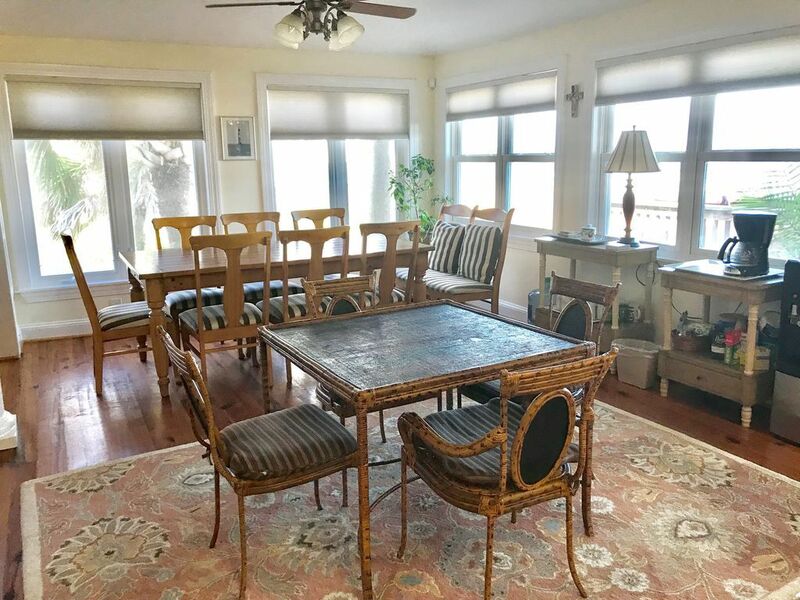 Enjoy scenic ocean views while you eat in the dining room that seats 10 or the breakfast bar that seats 4. 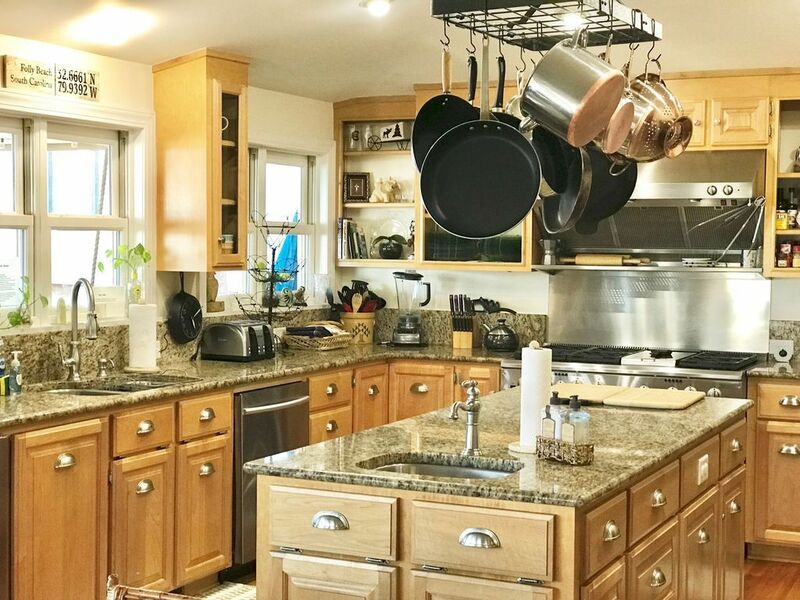 The gourmet kitchen is well appointed with ample supply of dishes, flatware, glassware, cookware, and utensils for your use. It boasts a gas range, double ovens, griddle, dishwasher,and a side-by-side refrigerator. 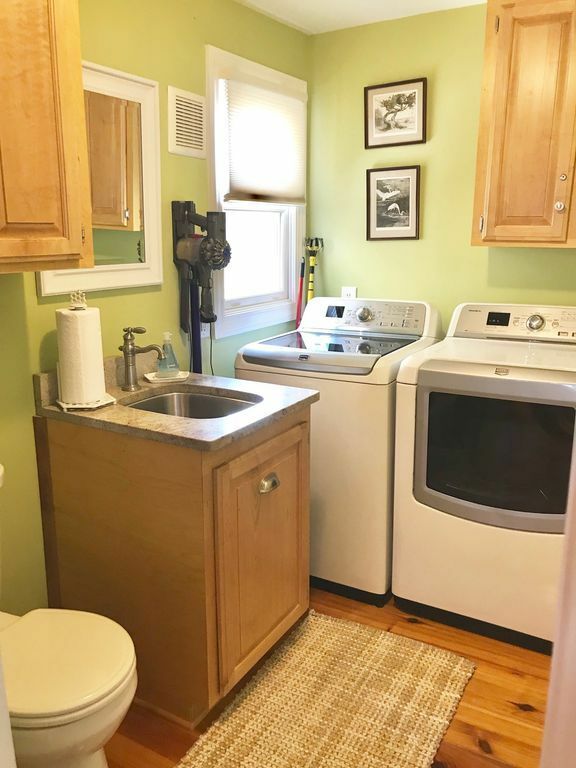 There is also a separate beverage kitchen and refrigerator. Great wood floors throughout the main level. The living room is amply furnished with comfortable couches, chairs, leather ottomans, and loveseats. 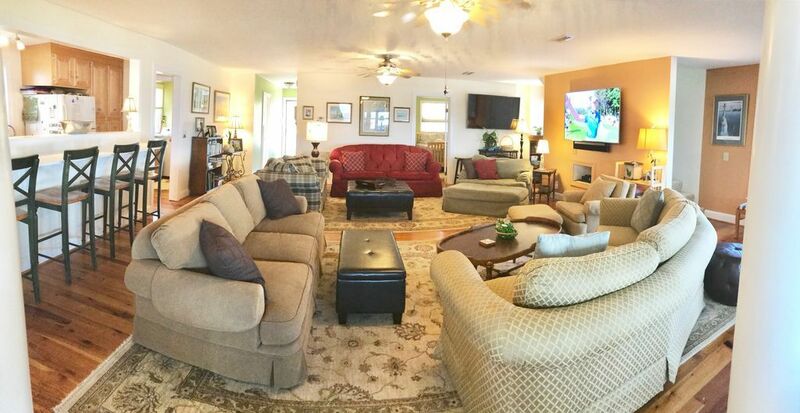 There are 2 large flat-screen HDTV, plus 6 more flat screens throughout the house. 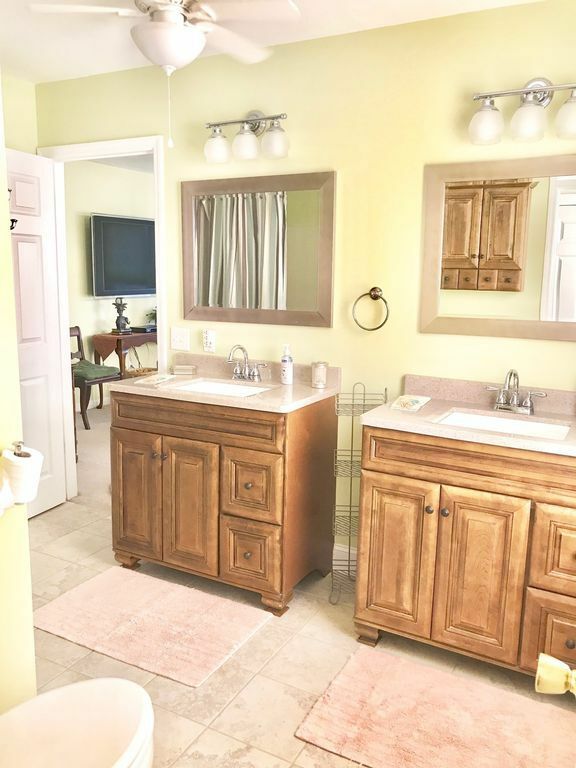 The first story features 1 1/2 baths and 2 bedrooms: one room with 1 queen; the other room with 1 double. 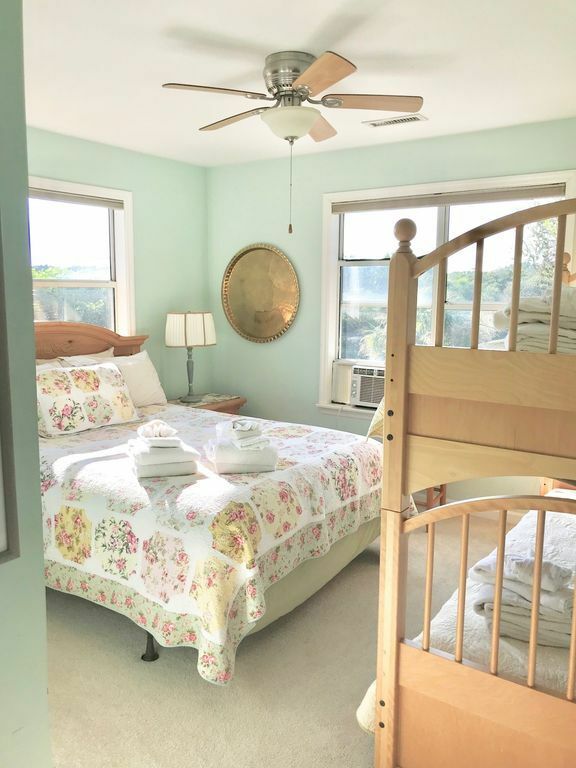 The second story has 2 baths and 4 more bedrooms:(1. an oceanside room with 1 queen 1 pull-out love seat); (2. another ocean side room with 1 queen and a single trundle set), (3. queen bed and set of bunks) , (4.a king bed and single trundle set).All bed linens and bath towels are supplied within your cleaning/ linen fee of $400. 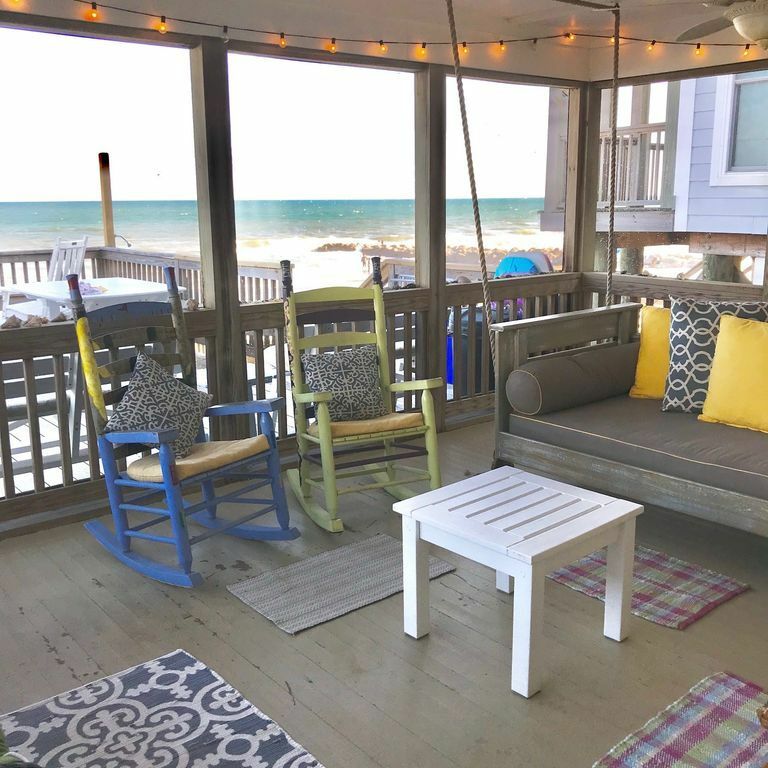 This is Ocean/beach front Huge deck with ample furniture, screened porch with swing bed, loveseat and rockers . Private beach walk over ! Outside showers with hot water. THIS IS FRONT BEACH you walk straight down to the ocean. 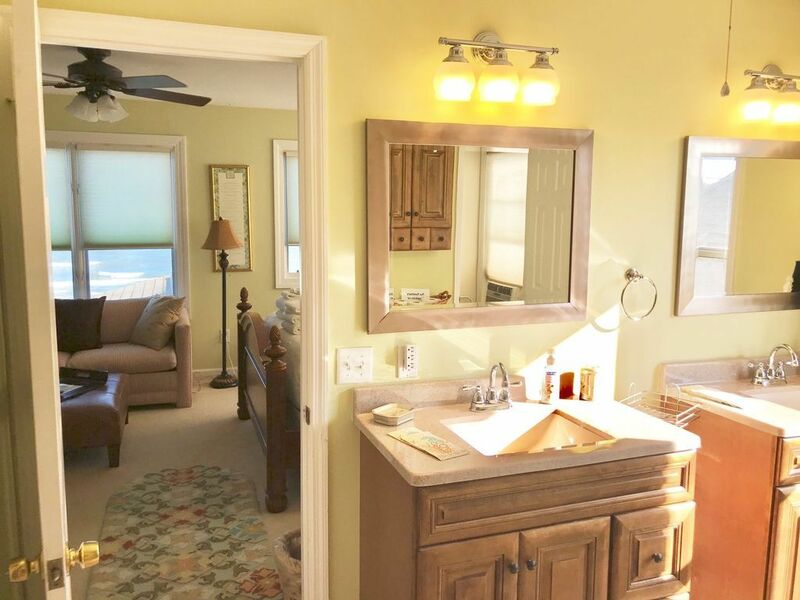 Stroll to the beach on a private beach walk, and rinse off in one of the two hot-water outside showers. 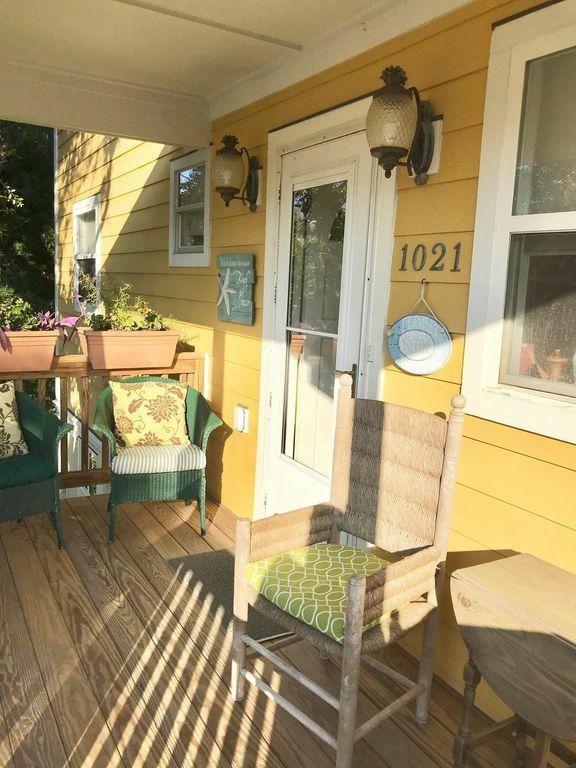 Or, just relax on a large deck, screened porch, and enjoy the hot tub! We had an issue in heat of summer 2016 and our visitor was very unhappy as one of the 3 central HVAC system just quit. My husband I I did everything humanly possible to get that 2 year old upstairs unit working properly. We encouraged the tenant to make other accommodations and we would refund his money, but he and his family wanted to stay. We gave them a generous rebate and even returned their full damage deposit even though we felt that not appropriate. It was hot and we really recognize that he and family were hot upstairs and we regret that they were uncomfortable. Two of the 3 central units were running and cooling and we even offered them use to another part of our property. 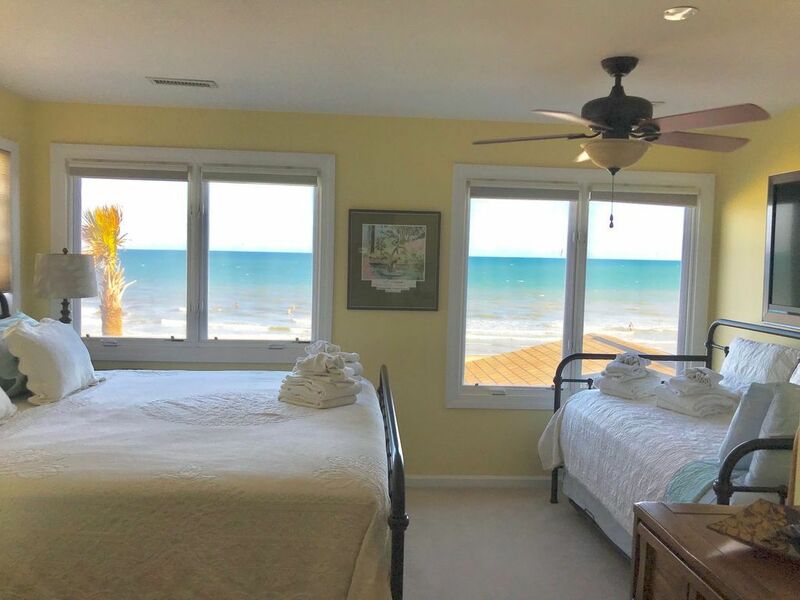 They have instead decided to post a very negative post about our beach home. I am sorry that the AC did not work during their visit. They left our house in disorder but we returned their deposit and just put all in order for our next visitor. We even installed window AC's upstairs in case this happens again but we couldn't make it happen quickly enough to help this tenant . The house is not dirty. We clean it very thoroughly between tenants. 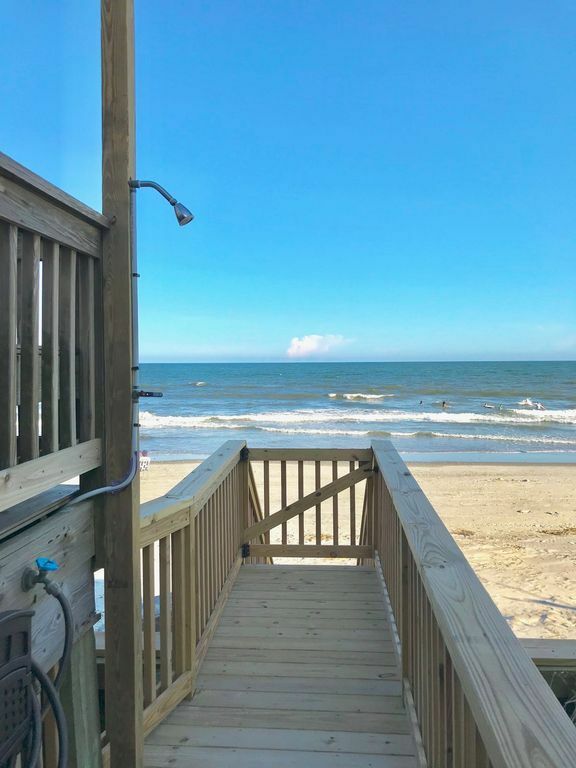 The perfect beach house for a family vacation! 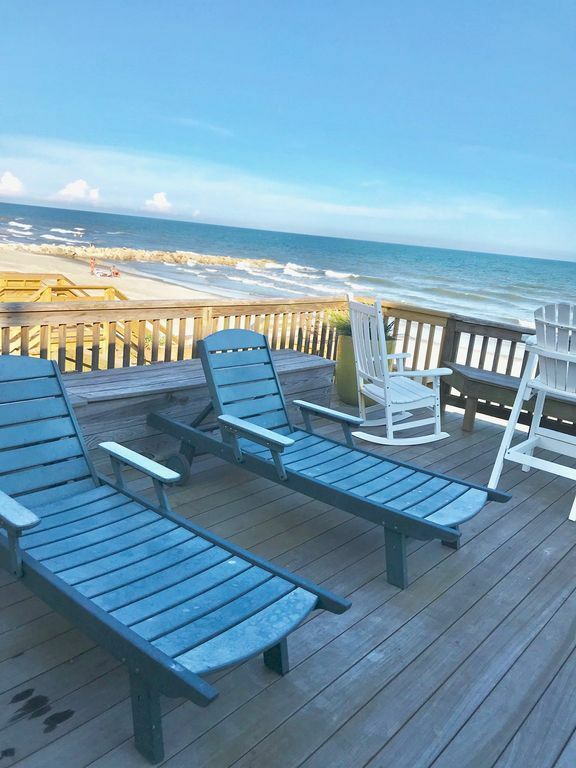 You can look up and down the North/South Carolina coast and you won't find a more perfect beach house for a family vacation at this price point. I promise you that! They thought of everything with this house! 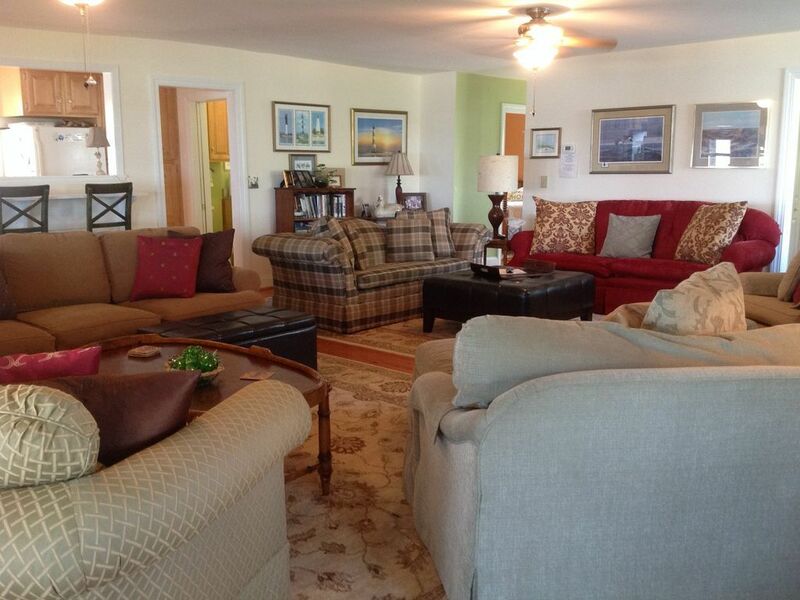 They have a huge open living room, with 4 comfortable couches and 2 plush lounge chairs. They have two massive HD TVs with cable and access to an Apple TV. The kitchen is massive and the stove/oven is almost commercial grade. The thing was a beast and we cooked family dinners there every night. As far as kitchen seating goes. A great dining table, a kids table and a kitchen bar was more than enough for our family of 17. 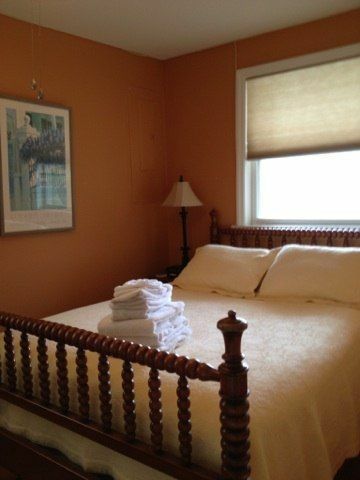 Then you have the bedrooms. 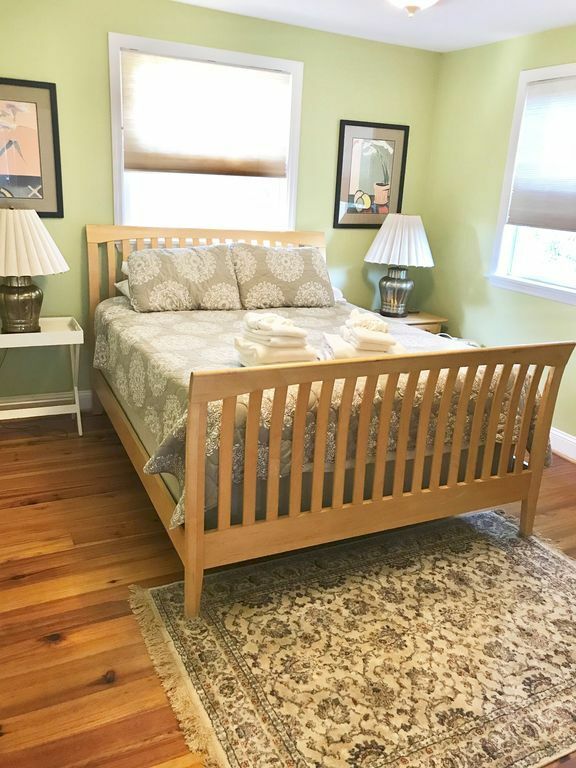 Clean, huge, and full of sleeping options (trundle beds/ pull outs / bunk beds. 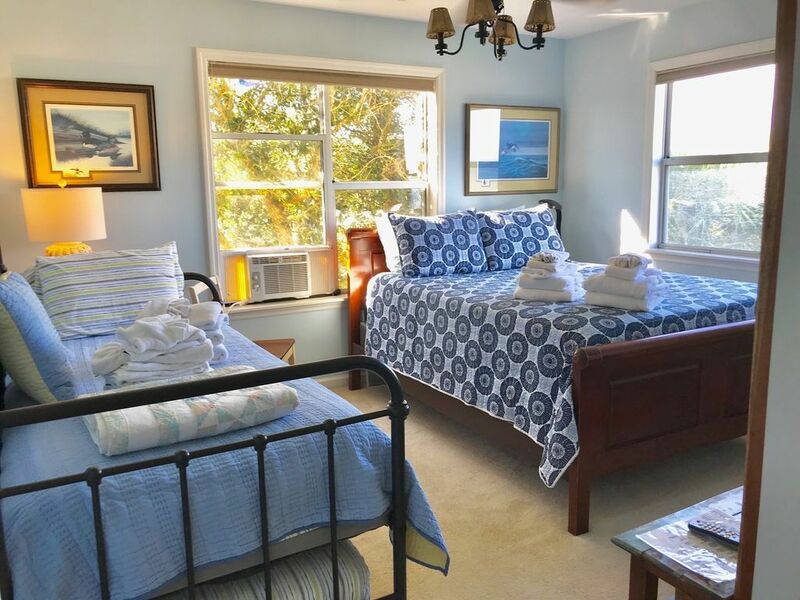 We had the ocean front room with a comfortable king bed and enough room for a pack and play for our little daughter. 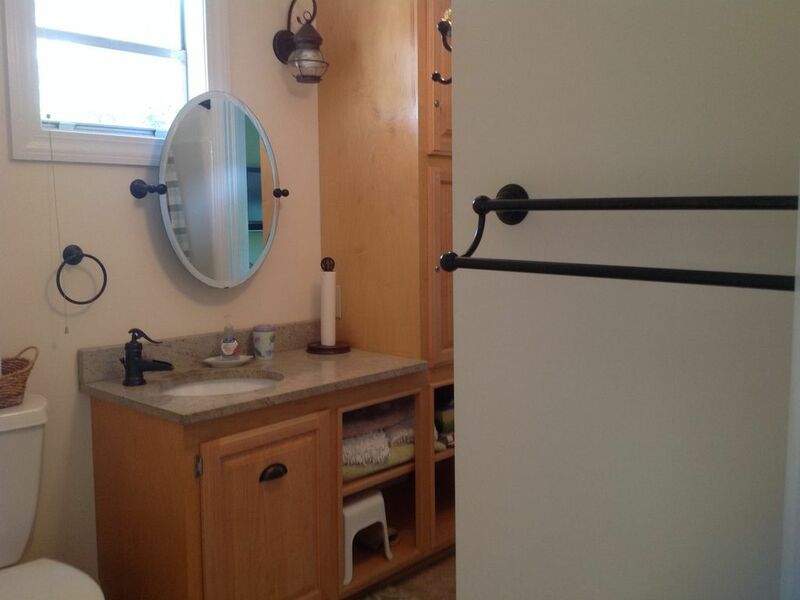 All of that is amazing, but the real seller here is the outside. A beautiful screened in porch with a huge couch swing made for a peaceful escape from the sun. Then there is the massive deck. I spend every morning and evening here. 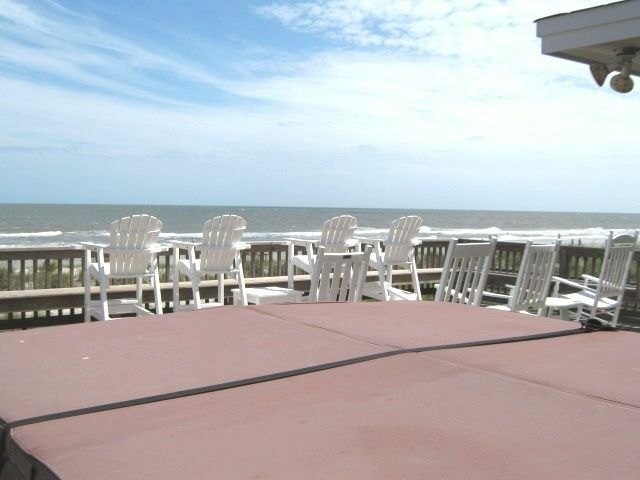 Sipping coffee or beer, or even having a snack on the outdoor table...all overlooking the ocean. 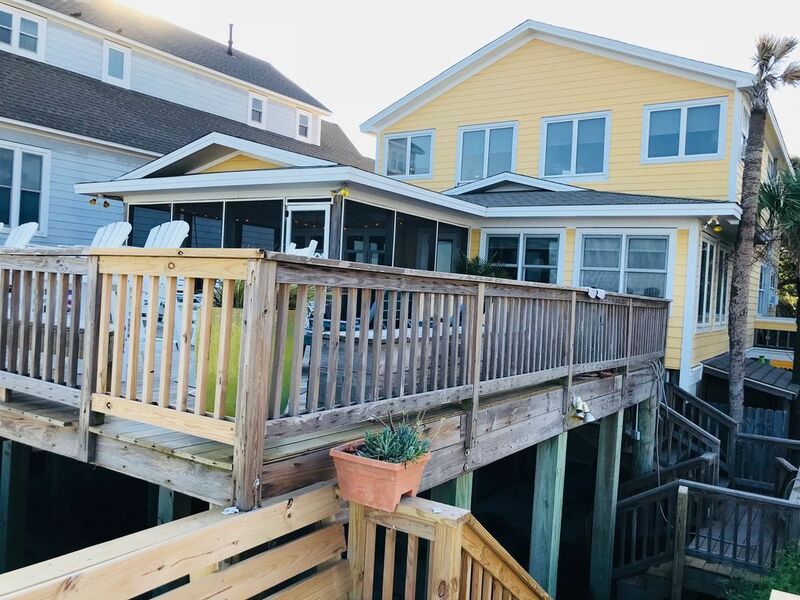 The deck furniture is sturdy and well-built, with cup holders so you can really just sit there relax with your drink and watch the ocean. Then there is the hot tub. I may never have been as relaxed as I was when the sun went down and I layed in the hot tub watching the waves crash. It made me want to never leave. 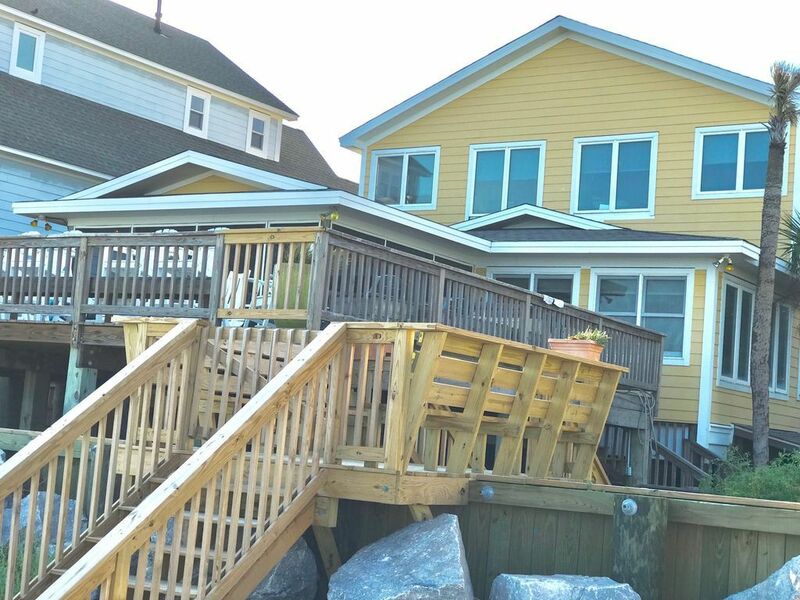 Lastly and the reason we booked this house to begin with, was the access to the beach. 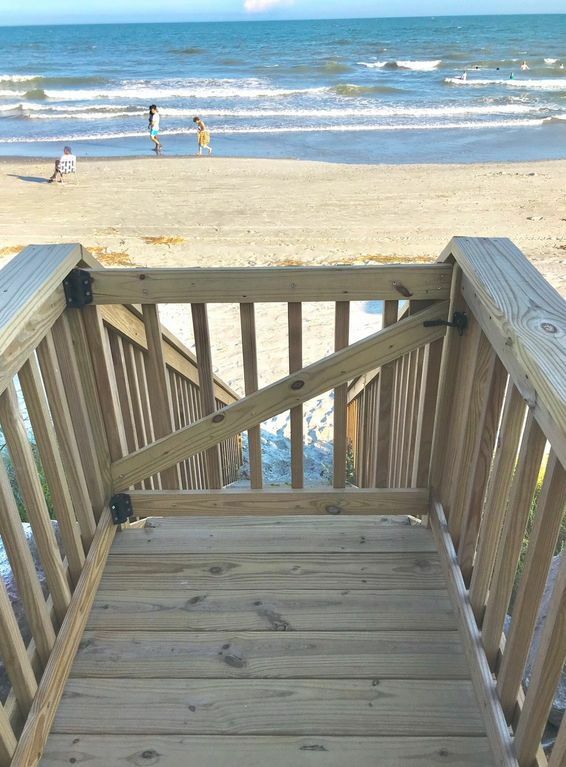 Literally, walk off the deck and you are on the beach. No long walk, no lugging down beach tents or toys. Just a few steps down and you're there. This made the trip amazing. If you have a little one that needs naps and constant breaks from the sun, it can't be beat. We put our little one down for naps and layed on the beach, with the video monitor on and still reaching down to our chairs. We haven't flet this relaxed since she was born. 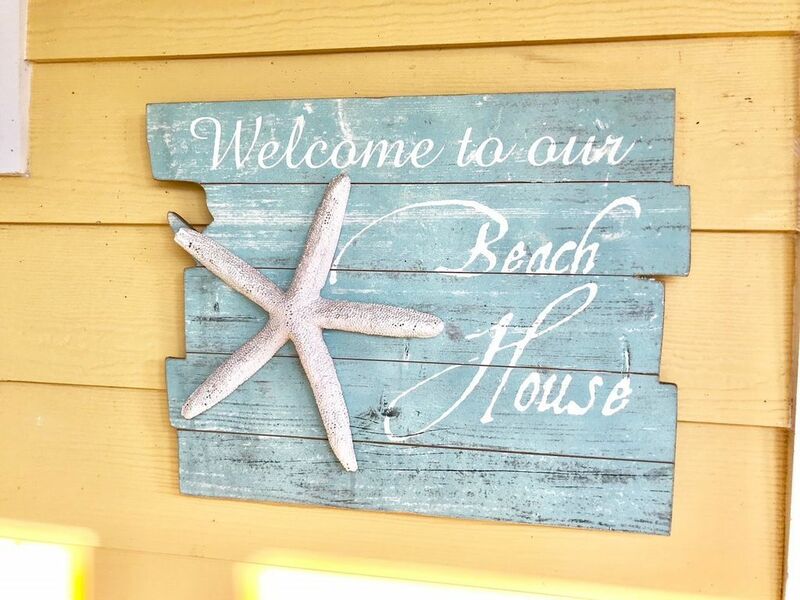 This was just the perfect beach trip and a lot of the reason why was because of this house. 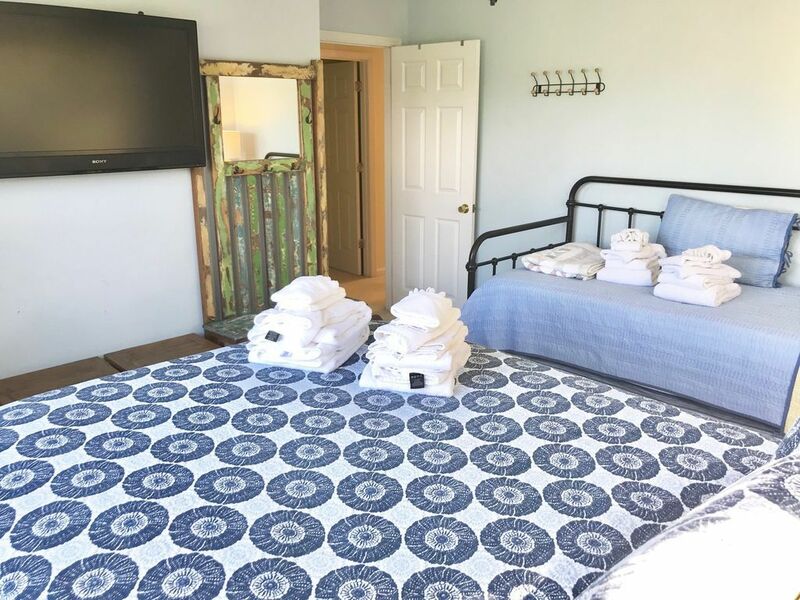 Candace and Robert have taken amazing care of this place and have done everything they can to ensure you have a wonderful stay. 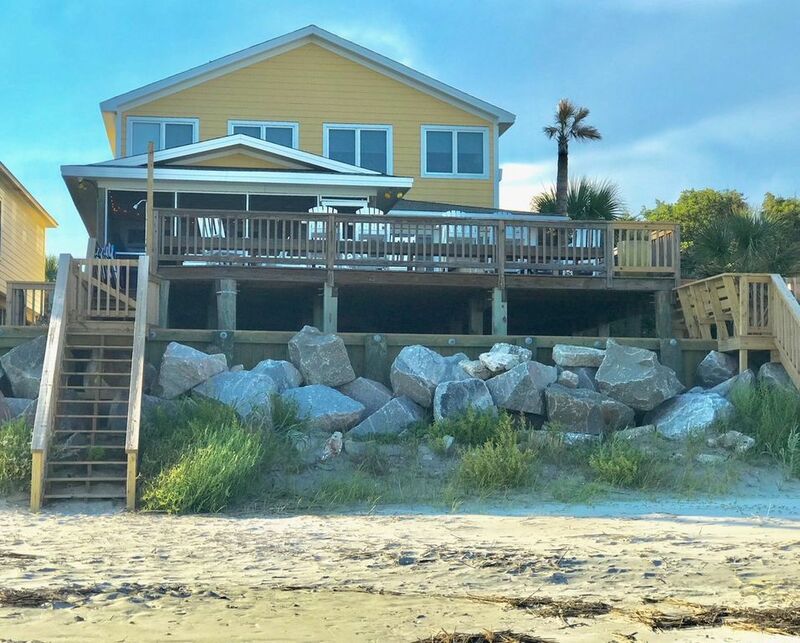 There likely isnt a better house for a family vacation in Folly Beach and you'd be hard pressed to find one on the east coast at this size and for this price. It was such a pleasure meeting the owners as we checked in and out. They truly love this home and enjoy sharing it with families who've come to make memories. 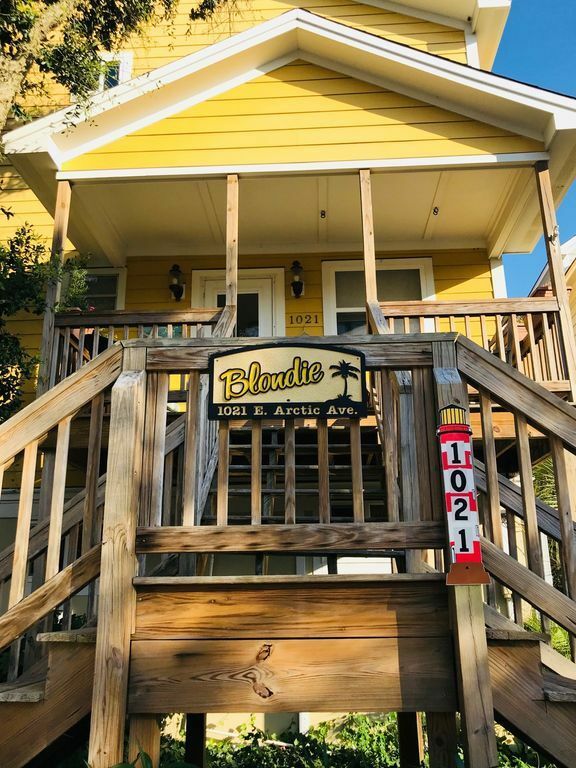 "Blondie" is right on the beach--just a dozen steps and you're there--what a plus! A perfect setting enhanced with the large deck, screened-in porch, and hot tub. 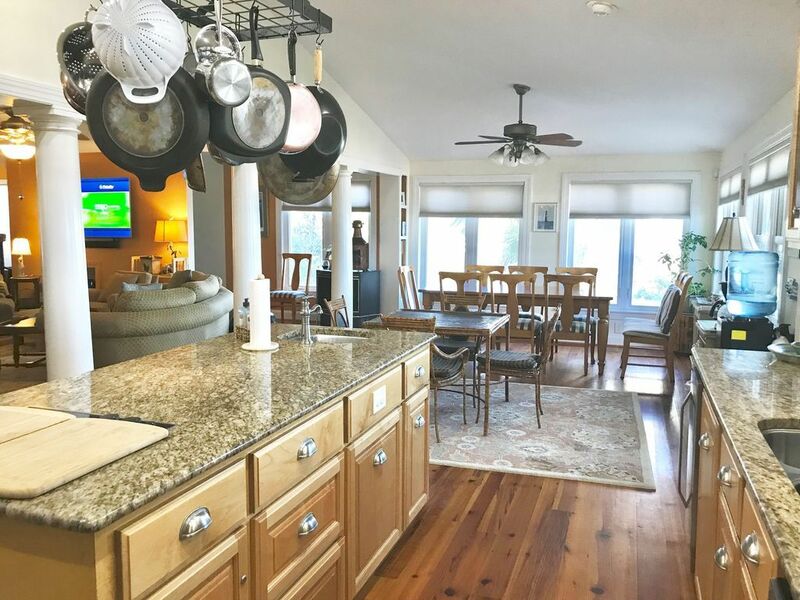 The interior space is well laid out: a huge living room and open kitchen that very comfortably accommodate large families with kids, all the while open to views of the ocean. 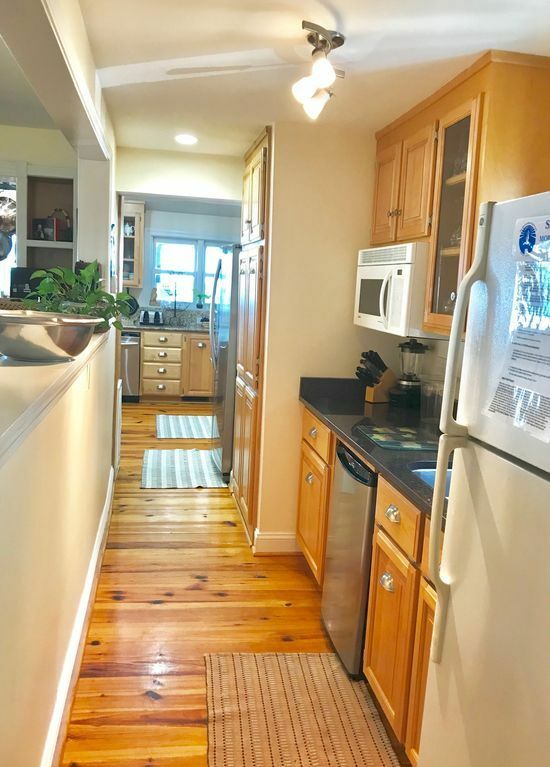 The kitchen and bar area are very well equipped with multiple refrigerators, top of the line range/oven, numerous small appliances and utensils. Entertainment while indoors includes flat screen TVs in every room. Books, games, and puzzles abound for all ages. Outdoor equipment and toys are abundant as well. 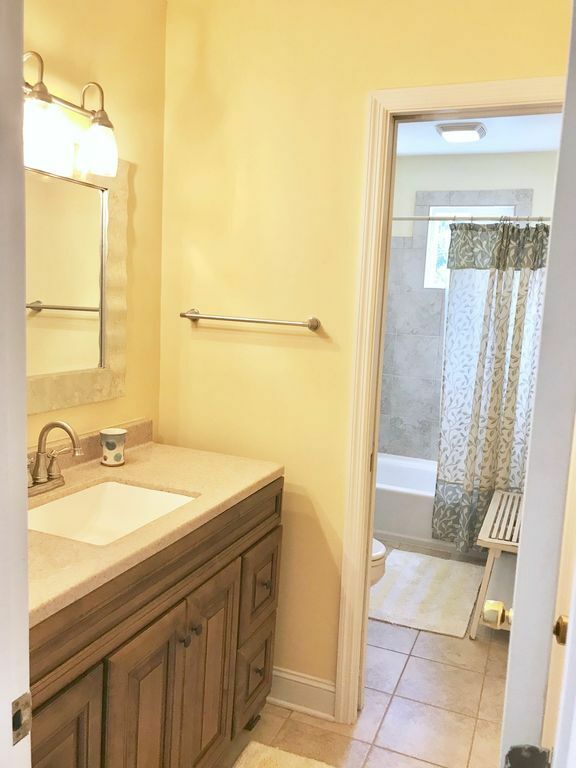 A delightful home easily enjoyed by large families. Wonderful home and Candace was great to work with. There were 18 of us there and we were all comfortable. 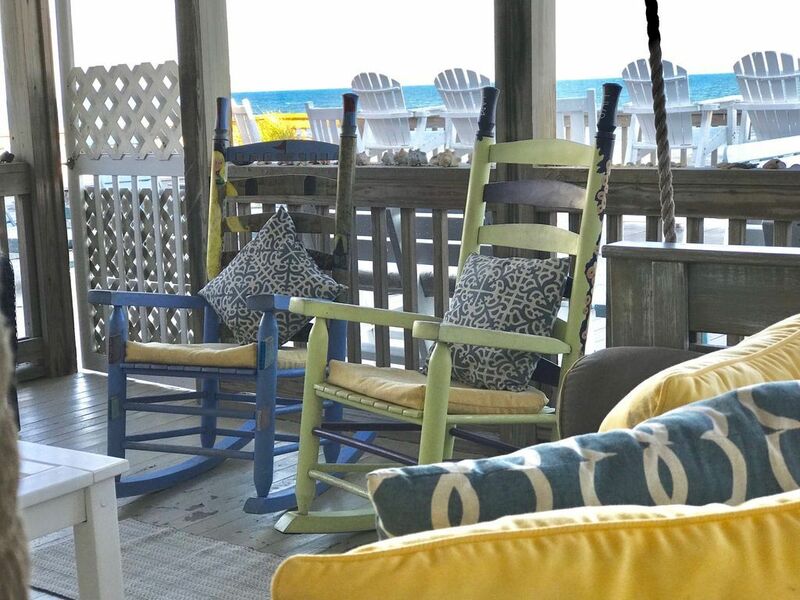 If we ever go back to Folly Beach, this is where we would want to stay. Great location. 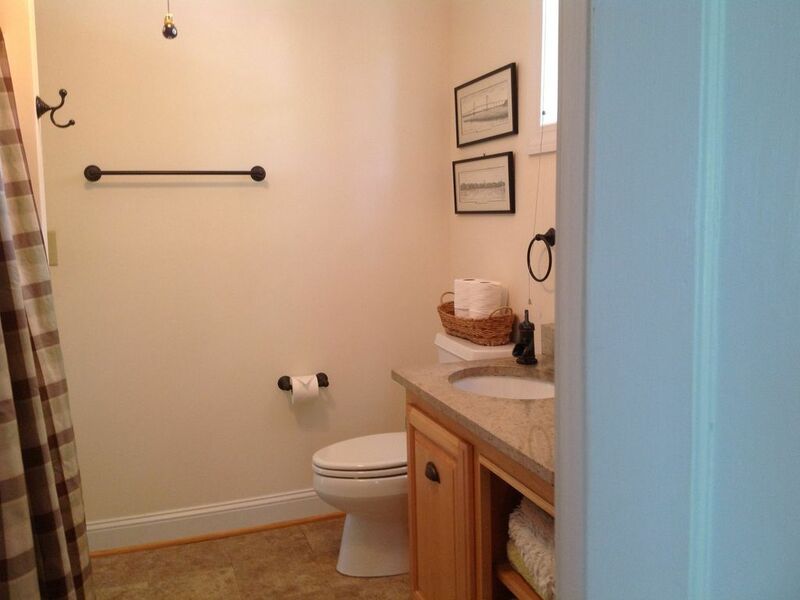 Roomy and attractive with well thought out features. No concerns other than the absence of air conditioning in small entryway bedroom. Easy communication with owners. Great week for our family. Thank you. Second summer renting this beautiful spacious home. 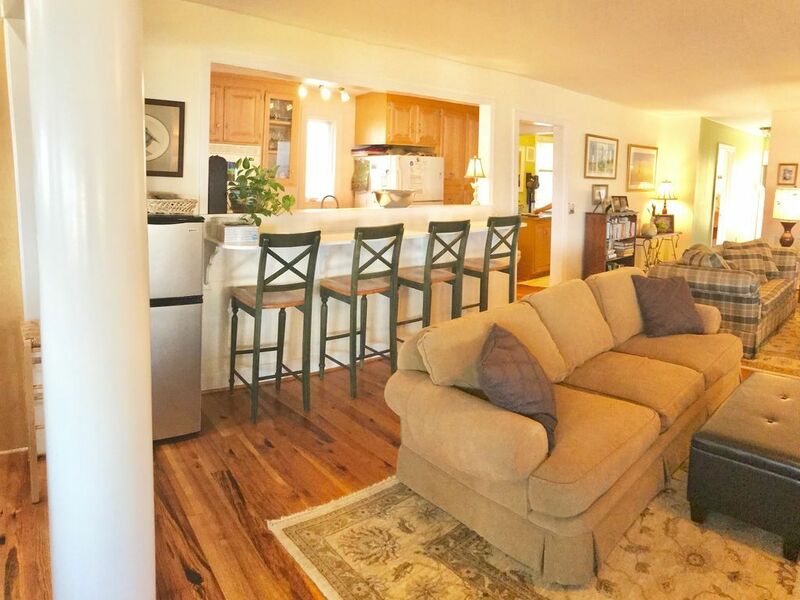 Fully equipped kitchen plenty of space, great screened in porch, deck with a hot tub overlooking the ocean. What more could you ask for? A gas grill. We spent a week with our sons and their families; and were beyond pleased with everything! The owners have thought of everything. 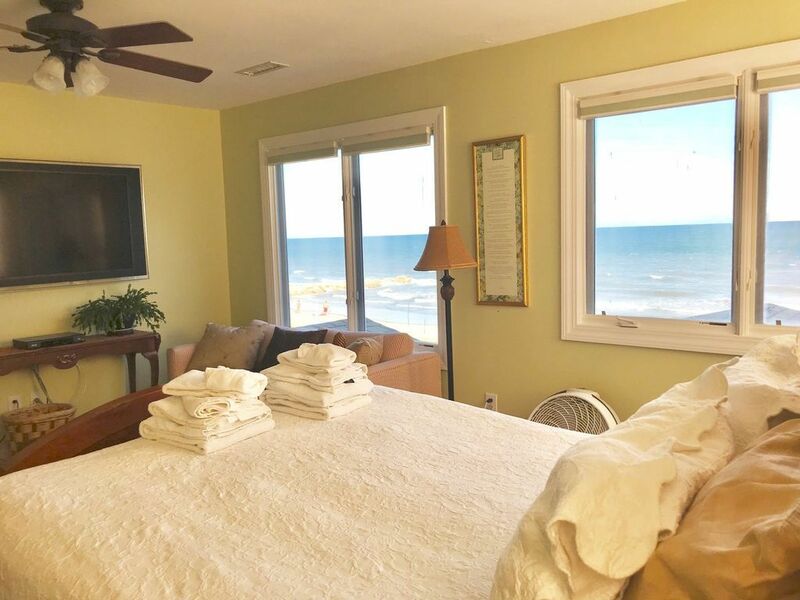 The house was very comfortable for the 11 of us; and the beachfront location was perfect! We would definitely stay here again. Candace was very communicative in the months leading up to the stay. The house was just as advertised. We had five adult couples and some kids and everyone fit the space great. Big open living room can accommodate the whole family. Immediate access to the beach is amazing. 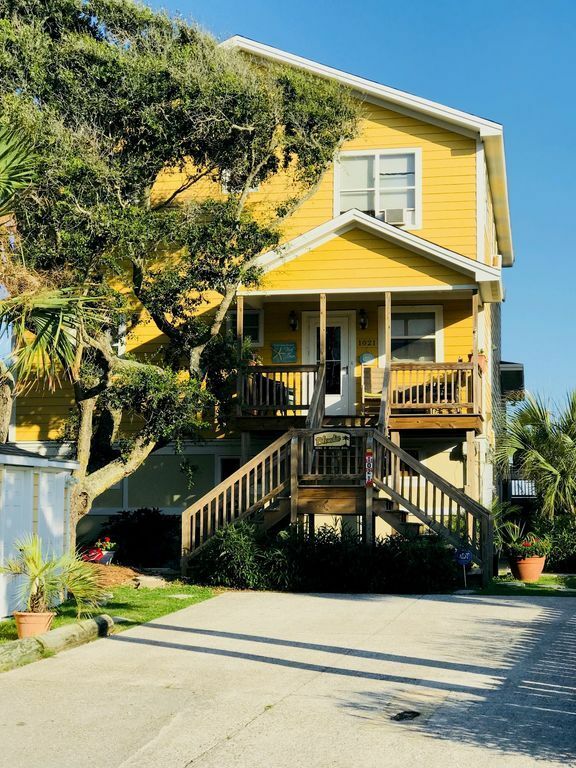 Best place you can rent on Folly!! We've been coming back to this place every other year. My wife and I got married on the beach right out in front of this house. Ive rented many places and this is my favorite. The owners are great and responsive. The home fits a lot of people comfortably indoors and outdoors. The whole house can literally hang out in the living room and not feel crammed. The open kitchen is high end and is great for cooking for a big group. It's a well built place with awesome upgrades. It has central air but also individual AC units in each room, which I think is incredible! 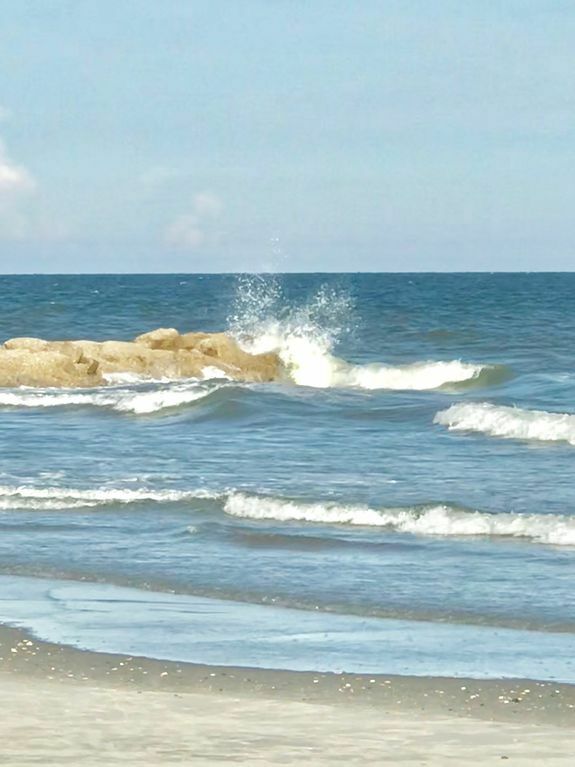 It's close enough to downtown Folly to enjoy it when you want but also far enough away that you feel removed from the busyness. The only problem is time flys to fast when you are there and your vacation is over before you know it. I highly recommend renting this home. We had a group of friends stay for several days together and it was perfect! Lot of individual bedrooms and bathrooms so we never felt crowded, and there was plenty of privacy. The screened-in porch was a great option and the kitchen was functional and well stocked. It was great to be right on the beach and we could see dolphins, birds and surfers from the comfort of the huge deck and tall deck chairs. Air con worked perfectly. Would definitely recommend! Parents/Geandparents looking for family vacation spot. Our family LOVED Blondie. 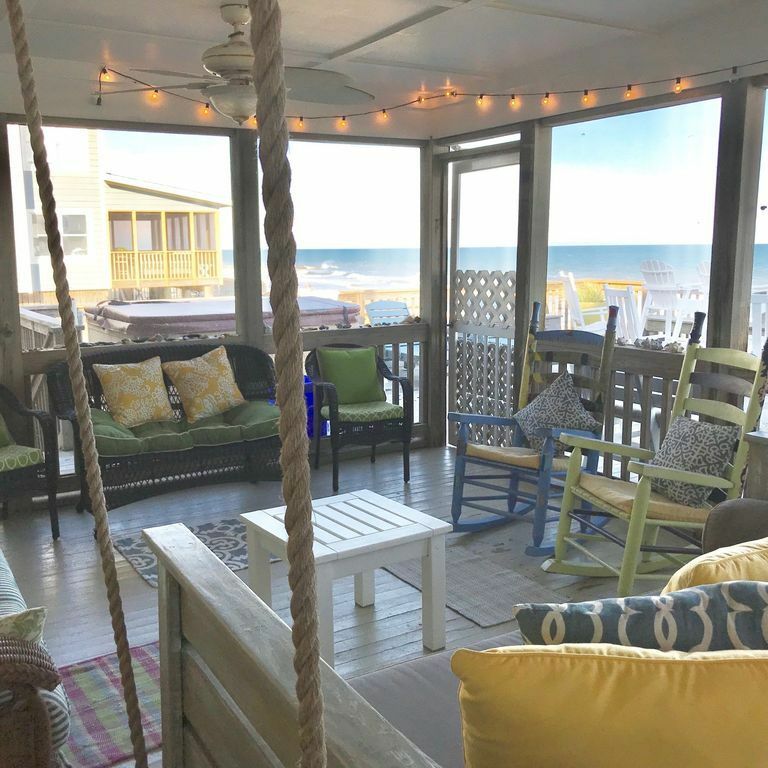 The house, porch (especially the swing), amenities, and beach location were perfect. We did not want for anything....the kitchen was well stocked with pots and pans along with a nice variety of spices. Having a washer and dryer was also great. 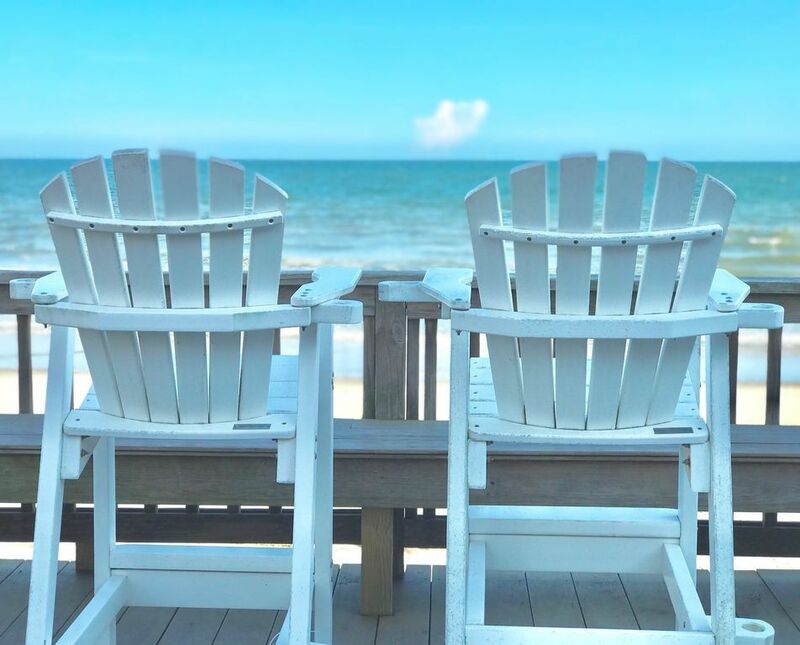 Being located on the beach was wonderful; we were able to sit comfortably on the porch and see the children on the beach (for those few times we weren't enjoying the sand and water with them). Most importantly the house was exactly as advertised!!!! Both the Pratts were wonderful and gave us complete information on the use of electronics and household equipment as well as advice on places to eat. We haven't been home a week and everyone is wanting to come back. THANK YOU!!!! Candace Pratt 8436965508 Show Phone No.